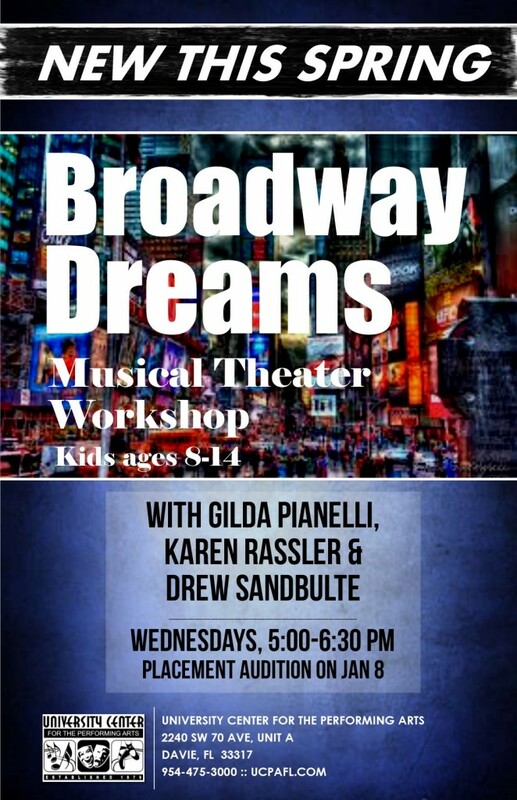 BROADWAY DREAMS is a brand new workshop the UCPA is proud to offer this spring semester. It will include musical theater training in the areas of singing, acting, and dance with the finest professional instructors: Karen Rassler, Gilda Pianelli, and Drew Sandbulte. This workshop, for ages 8-14, meets on Wednesdays from 5:00-6:30 pm beginning January 8 and will culminate in an exciting musical theater review at the end of the session. For more information, call us at 954-475-3000.